U.V. MASTERis a self-sealing waterborne, acrylic fortified urethane, exterior wood coating designed ..
U.V. MASTERis a self-sealing waterborne, acrylic fortified urethane, exterior wood coating designed for the toughest of situations. UV-MASTER has unique UV absorbers and blockers to permit its use in exterior applications. It dries hard yet not brittle and maintains its flexability. 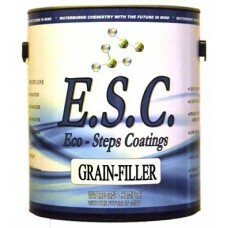 Ease of application, hi-build, and quick dry-time are properties built into this glaze coating. Application:UV-MASTER is designed to replace conventional solvent based lacquers and as such should be sprayed. Stir gently so as not to create air bubbles and then strain. Do not over-apply. Thin coats are better than heavy coats. Product should not go on looking milky. If it does you have applied too much and dry time will be lengthened substantially. Dry Time:UV-MASTER is designed to dry to sand at 75 F in less than 20 minutes. Re-coat immediately after sanding. It is safest to apply no more than 2-3 coats per day. Product must be completely dry before another coat is applied. Maximum hardness occurs after 7 days. Note:Although rated for exterior use and much testing has been done, there are many variables which will affect the life of the product and its substrate in an exterior situation. The less direct southern exposure the better. Clean-Up: Clean and flush all equipment with water immediately after use.